The Galaxy S9 and S9 Plus may not even have gone on sale yet, but the devices have already started receiving software updates, according to a report from SamMobile. The update brings along the March Android Security patch, alongside some bug fixes, stability improvements, performance enhancements and enhanced features. Although, it isn’t immediately clear as to what those ‘enhanced features’ entail. 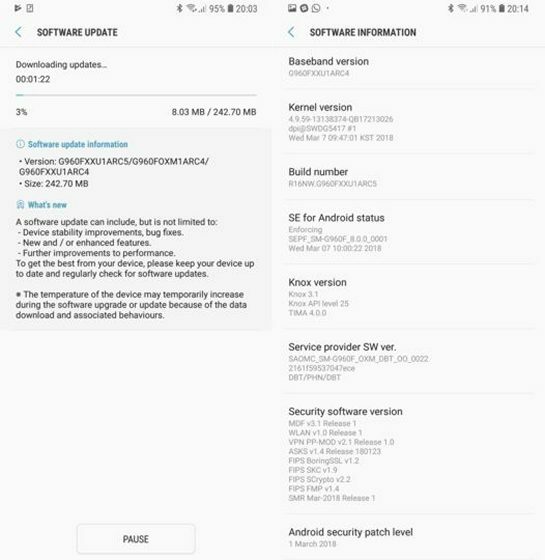 As can be seen in the screenshots above, the update weighs in at 242 MB, and comes with build number G960FXXU1ARC5 for the Galaxy S9 and G965FXXU1ARC5 for the S9 Plus. The update is currently rolling out in Germany, and is expected to hit the rest of the world soon. If you’re planning to buy either of the devices, you’ll probably get the new update notification the moment you connect to the net, but in case you don’t, you can always check for it manually by going over to Settings > Software Update. Meanwhile, the two devices are already making news for all the right reason, and have already earned multiple awards since their unveiling a couple of weeks ago. While the Galaxy S9 Plus won the GLOMO Award for being the ‘Best Connected Device’ at the MWC 2018, DisplayMate awarded the Galaxy S9 for having the best display among all smartphones. The S9 Plus also received the highest DxOMark score of 99 for its rear-facing cameras, eclipsing the Pixel 2’s score of 98. Now, the devices can add yet another feather to their cap, thanks to a little experiment carried out by Tom’s Guide. According to tests conducted by the blog, the Samsung flagships have much faster downlink and uplink speeds on cellular connections than Apple’s current flagship, the iPhone X.
Tom’s says that the Galaxy S9 Plus averaged 71.6Mbps download speeds on T-Mobile’s 4G network in New Jersey, while the iPhone X could only manage 48.8Mbps. Average upload speeds were also higher on the Samsung device at 10.1Mbps, while the Apple device could only muster 7.7 Mbps. 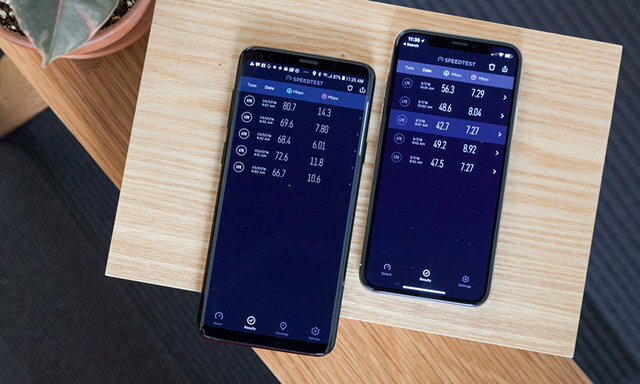 As can be seen from the image above, the company used the industry-standard Speedtest.net app for its tests, and repeated the tests for 5 times to calculate the average. The difference, of course, is not entirely unexpected, given that the US versions of the Galaxy S9 twins are powered by Qualcomm Snapdragon 845, which comes with the X20 LTE modem that supports Cat.18 LTE with peak download speeds of up to 1.2 Gbps. The iPhone X, meanwhile, ships with the A11 Bionic SoC that’s otherwise believed to be faster than the Snapdragon 845, but only ships with the X16 LTE modem that supports Cat.16 download speeds of up to 1 Gbps speeds.